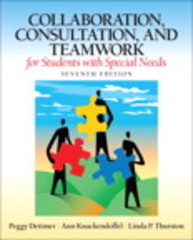 Collaboration, Consultation, and Teamwork for Students with Special Needs 7 Edition The seventh edition ofCollaboration, Consultation, and Teamwork for Students with Special Needs,focuses on collaboration in a variety of environments and emphasizes constructive ways to use educator differences to serve students with special needs. This text’s broad perspective ensures coverage of the history of collaboration, ways to structure and implement collaborative teams, important processes and practices that ensure effective co-educator partnerships, and the external support that makes collaborative school consultation successful. The seventh edition features new chapters devoted to professional perspectives, personal preferences, paraeducators and evaluation techniques. With expanded Technology Tools sections, coverage of the latest educational reforms, and updated activities, this edition prepares educators, school personnel, families, and community leaders with a strong knowledge base that celebrates the strengths in personal differences.